An extraordinary opportunity to own one of the most unique and exciting properties to become available in years. 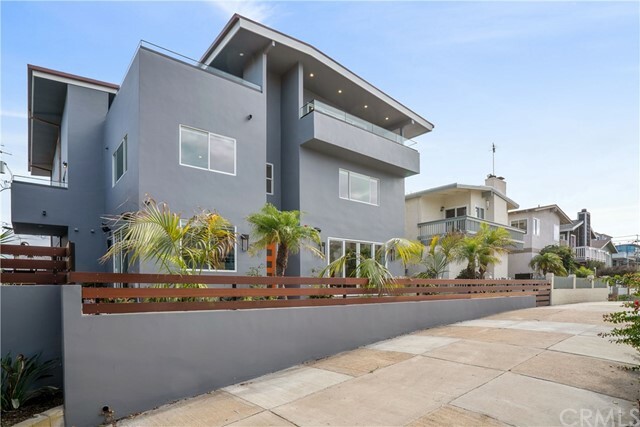 Sitting on a near double lot (a rare 60 feet of prime walk street frontage), this property consists of a 3,600 sq ft 4 bedroom main house with (two) 2 bedroom and 2 bath income or guests homes. The home has been fully remodeled down to the studs with new HI-END EVERYTHING! No expense was spared on the development of this legal triplex. Each of the apartment style units is approximately 1,200 sq ft with a total combined sq ft of approx 6,000 sq ft. There are nice ocean views from the top floors and a fabulous indoor outdoor upper level that surely will be the highlight of the parties! The main home features include 4 bedrooms all with their own baths and two half baths. All of the units have Central Air Conditioning, security and AV systems, top of the line Thermadore stainless appliances, flat screen TV&apos;s throughout, washer and dryers, 7" wide plank oak floors, and more...The property boasts an incredible 12 legal parking spaces and has great views of the ocean, mountains, valley, Catalina, and Malibu. The location is near everything we love about Manhattan Beach. Just blocks to the shops and restaurants of downtown MB, parks, award winning Grandview elementary school, and the beach.